GC: Can you tell us a bit about your new company? 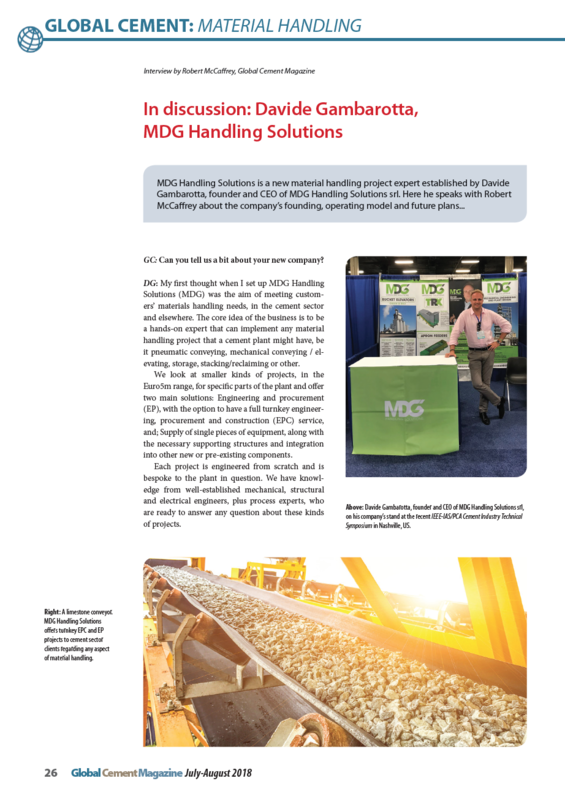 DG: My fi rst thought when I set up MDG Handling Solutions (MDG) was the aim of meeting customers’ materials handling needs, in the cement sector and elsewhere. Th e core idea of the business is to be a hands-on expert that can implement any material handling project that a cement plant might have, be it pneumatic conveying, mechanical conveying / elevating, storage, stacking/reclaiming or other. We look at smaller kinds of projects, in the Euro5m range, for specifi c parts of the plant and off er two main solutions: Engineering and procurement (EP), with the option to have a full turnkey engineering, procurement and construction (EPC) service, and; Supply of single pieces of equipment, along with the necessary supporting structures and integration into other new or pre-existing components. Each project is engineered from scratch and is bespoke to the plant in question. We have knowledge from well-established mechanical, structural and electrical engineers, plus process experts, who are ready to answer any question about these kinds of projects. GC: How did MDG come to be set up? 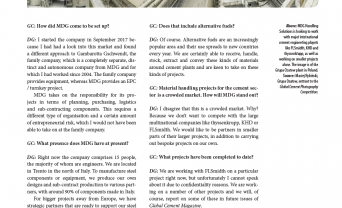 DG: I started the company in September 2017 because I had had a look into this market and found a different approach to Gambarotta Gschwendt, the family company, which is a completely separate, distinct and autonomous company from MDG and for which I had worked since 2004. The family company provides equipment, whereas MDG provides an EPC / turnkey project. MDG takes on the responsibility for its projects in terms of planning, purchasing, logistics and sub-contracting components. This requires a different type of organisation and a certain amount of entrepreneurial risk, which I would not have been nable to take on at the family company. GC: What presence does MDG have at present? DG: Right now the company comprises 15 people, the majority of whom are engineers. We are located in Trento in the north of Italy. To manufacture steel components or equipment, we produce our own designs and sub-contract production to various partners, with around 90% of components made in Italy. For bigger projects away from Europe, we have strategic partners that are ready to support our steel structure and equipment needs close to the project. This is the case for some equipment such as bag filters. We don’t manufacture them, so we buy them in from other suppliers and integrate them into the package that we provide to the customer. 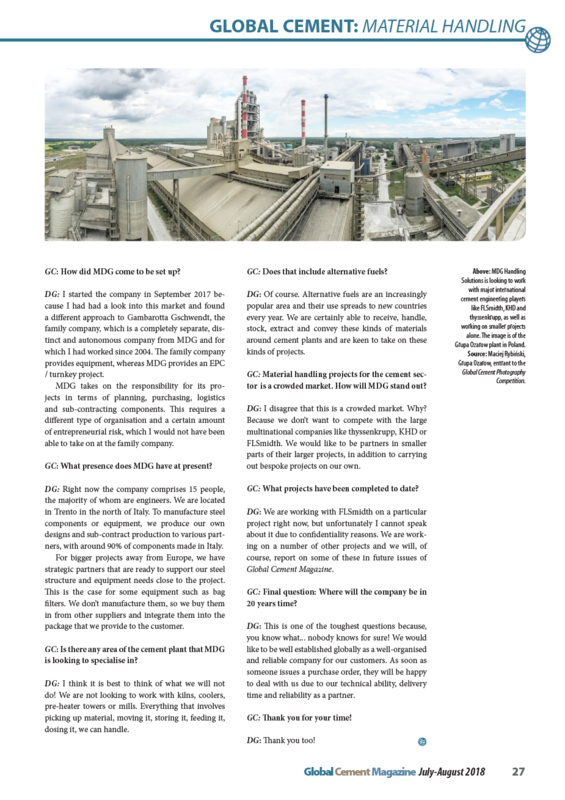 GC: Is there any area of the cement plant that MDG is looking to specialise in? DG: I think it is best to think of what we will not do! We are not looking to work with kilns, coolers, pre-heater towers or mills. Everything that involves picking up material, moving it, storing it, feeding it, dosing it, we can handle. GC: Does that include alternative fuels? DG: Of course. Alternative fuels are an increasingly popular area and their use spreads to new countries every year. We are certainly able to receive, handle, stock, extract and convey these kinds of materials around cement plants and are keen to take on these kinds of projects. 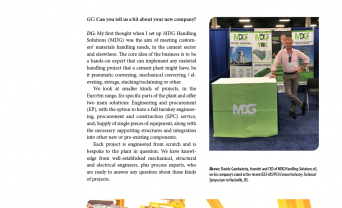 GC: Material handling projects for the cement sector is a crowded market. How will MDG stand out? DG: I disagree that this is a crowded market. Why? Because we don’t want to compete with the large multinational companies like thyssenkrupp, KHD or FLSmidth. We would like to be partners in smaller parts of their larger projects, in addition to carrying out bespoke projects on our own. GC: What projects have been completed to date? DG: We are working with FLSmidth on a particular project right now, but unfortunately I cannot speak about it due to confidentiality reasons. We are working on a number of other projects and we will, of course, report on some of these in future issues of Global Cement Magazine. GC: Final question: Where will the company be in 20 years time? DG: This is one of the toughest questions because, you know what... nobody knows for sure! We would like to be well established globally as a well-organised and reliable company for our customers. As soon as someone issues a purchase order, they will be happy to deal with us due to our technical ability, delivery time and reliability as a partner. GC: Thank you for your time! From the experience gained into field, Davide Gambarotta started officially and operatively in September 2017 a new company in order to offer not only handling equipment but a complete service on EPC basis.